tips to help you get the best out of your slow cooker or crock pot. Have you an old Crock pot or slow cooker hiding in the back of the cupboard. Or maybe you have a slow cooking setting on your cooker. 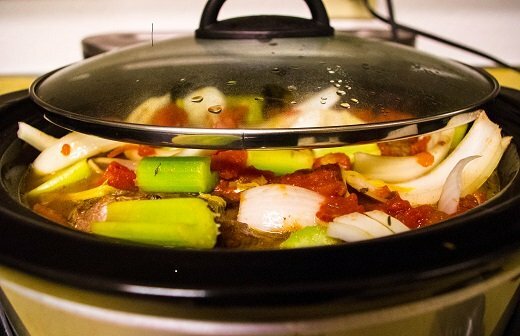 Using this technology or investing in a slow cooker is a good and inexpensive investment for creating simple tasty and nutritious food on a weekday evening. All it needs is a little forward planning. The bonus is there will be no need to do more in the way of food prep, and that there will be a hot and nutritious meal waiting for the family. So if you have one of these old pots gathering dust somewhere at the back of a cupboard, or you haven’t got to grips with the technology on your oven I recommend you renew your relationship with slow cooking. It is a good friend to any busy mum. There are lots of occasions when using a slow cooker can be useful – not just at the end of a busy day when you are feeling exhausted. Sundays – when you have family or friends visiting and you don’t want to spend all the time in the kitchen. Like most things in life the more you use your slow cooker and get to know it the more adventurous you will become with what you cook. But if you are starting out and are unsure of the rules around slow cooker and crock pot cooking the following will act as a good common sense guide. Although we have never had a bad experience with our Slow cookers, there are a few safety measures you need to follow to ensure food safety. Some of them are pretty basic and common sense and you are probably doing them already. But it never hurts to go over them and to just continue to be aware of the importance proper food handling and preparation techniques. Always start clean, a clean cooker, clean utensils, a clean work area. And wash your hands before and during food preparation. Be sure to handle ingredients carefully. Since slow cookers can take a while to get to temperatures hot enough to kill off bacteria, it is imperative to keep the ingredients constantly refrigerated prior to food preparation. Remember that bacteria multiply on food quickly at room temperature. Therefore perishable foods should remain refrigerated until you need them. Defrost your meats and poultry prior to putting them in your slow cooker. This helps the Crock pot achieve proper cooking temperature faster, eliminating the possibility of bacteria growth on your food. Cutting food into smaller chunks helps to ensure that the food is cooked thoroughly. For example, don’t cook large pieces of meat such as a whole chicken in the slow cooker. Doing this increases the opportunity for bacterial growth because it takes a longer time to get to proper cooking temperature. Meats and vegetables can be cut up in advance but make sure you store them separately in covered containers. Keep the lid on. Experts say that removing the lid can add 20 minutes to the cooking time! This is because it takes that long to re-generate the lost heat and steam. Remove it only to stir the food or check whether it is cooked. Since vegetables cook slower than meat, place the vegetables on the bottom. Then add the meat and cover the food with your broth, sauce, or water. If possible, set the slow cooker setting on high for the first hour of cooking to get the food warmed up quickly. Then switch it to low for the rest of the day. If it is not possible, the Food Safety and Inspection Service says it is still safe to cook foods on low for the entire time, since the temperatures stay hot enough for long enough to prevent any bacterial growth on the food. If you are away during the entire slow-cooking process and you know that there has been a power outage, don’t take any chances. Throw the food out. Although it may look done, it could also be unsafe for consumption. You can know if there was a power outage by the time flashing on your other appliances such as microwave or VCR. If you are home during a power outage, complete the cooking another way -gas stove, etc. A food thermometer can be used to test for ‘doneness’ on your meat and poultry to make sure they have reached a safe internal temperature: Poultry – 170 deg for chicken breast – 180 deg for chicken thigh Ground Meat- 160 deg Roasts -145 degrees (medium rare) -160 degrees (medium) -170 degrees (well done) Casseroles -165 degrees Stuffing – 165 degrees Soups – 165 degrees And when it comes to leftovers, make sure you refrigerate them within two hours after cooking is finished. Store them in shallow covered containers. It is not recommended that you use a slow cooker to reheat these leftovers.